Government plans to cut congestion via a national road charging scheme are "in tatters", the Conservatives have said. The claim came as Transport Secretary Ruth Kelly admitted concerns about privacy, fairness and enforcement could not yet be satisfactorily answered. More pilot schemes were needed with any scheme "many years" away, she said. She said that a more immediate way of cutting congestion was to let drivers use hard shoulders on parts of the M1, M6, M62, M27, M4 and M5 in England. The move follows a successful trial on the M42 near Birmingham, where the hard shoulder was used as an extra lane and the speed limit reduced to 50mph. Shadow transport secretary Theresa Villiers said the government's policies on congestion "now lie in tatters". The announcement was "further evidence that their flagship proposal for a spy in the sky national road pricing scheme is going nowhere". "They should now rule this option out completely," she said. Lib Dem Norman Baker described the measure as a "dogs dinner of a policy". "A national road pricing scheme to replace other road taxes is undoubtedly the way forward, but this latest fudge from ministers will please nobody. "It confuses the purpose of a hard shoulder, which we have been told for decades exists for safety reasons." In a keynote speech, Ms Kelly said the hard-shoulder option would also include motorways which join the M25, such as the M20 and M3. Other plans - such as having a motorway lane which could not be used by cars with only one person inside as well as HGV crawler lanes - were also being considered. A further four years of funding for local road pricing pilot schemes - which have been described as forerunners for a future national road pricing scheme - was also announced. In her speech on Tuesday, Ms Kelly made no mention of any proposals for national road pricing, which last year prompted a record-breaking 1.8 million people to sign an online Downing Street petition opposing any such plan. But she later told BBC Radio 4's World at One: "People legitimately raised concerns about privacy, fairness and how any scheme would be enforced. "We don't have all the answers to those questions yet. We can't introduce this without having answers to those questions. "What we are going to do is trial technology over the next couple of years - asking private sector companies to work with volunteers and see whether they can answer some of those fundamental issues." In the Commons, she refused requests to rule out a road pricing scheme, saying instead her priority was "to focus on the congestion of today's motorists". She described the decision to go for the hard shoulder-option as "a nifty over-taking manoeuvre past stationary traffic". A green paper on motorway congestion schemes will be published in the summer, with "pay as you drive" motorway lanes coming into force around 2010. Ms Kelly said the M42 experiment had given the government valuable experience of a new approach to managing motorway traffic. "Through a mix of managing speeds and opening the hard shoulder as a running lane, the M42 has shown it is possible to smooth traffic flow and improve journey reliability on a notoriously congested route - and it has done so safely," she said. A Department for Transport feasibility study identified around 500 miles of England's motorways which could benefit from using the hard shoulder as an extra lane. In the scheme, sensors detect traffic build-up, which triggers signs telling drivers to slow down and use the extra lane. Emergency refuges were established every 500m. If accidents happen, messages appear telling drivers the lane is closed, allowing emergency services to get through. In the first six months of the M42 trial, average journey times fell by more than a quarter on the northbound carriageway, fuel consumption reduced by 4% and vehicle emissions dropped by up to 10%. Ms Kelly said the government was interested in car share lanes of the type used in the US for some time, where access is limited to vehicles carrying passengers or drivers willing to pay a toll. Tony Bosworth, of Friends of the Earth, said: "The extra capacity is going to encourage more traffic on to our roads which may lead to more climate changing pollution. "And if we're going to be allowing drivers to pay to use one lane then that just provides a choice for those who can afford it." 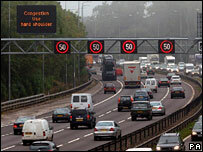 Driving on the hard shoulder is well established in some European countries, such as Germany and the Netherlands.